Soleymanfar, V., Taleizadeh, A., Pourmohammad Zia, N. (2015). Economic manufacturing model under partial backordering and sustainability considerations. Journal of Industrial and Systems Engineering, 8(2), 86-96. Vahid Reza Soleymanfar; Ata Allah Taleizadeh; Nadia Pourmohammad Zia. "Economic manufacturing model under partial backordering and sustainability considerations". 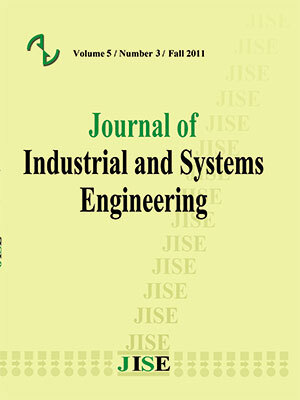 Journal of Industrial and Systems Engineering, 8, 2, 2015, 86-96. Soleymanfar, V., Taleizadeh, A., Pourmohammad Zia, N. (2015). 'Economic manufacturing model under partial backordering and sustainability considerations', Journal of Industrial and Systems Engineering, 8(2), pp. 86-96. Soleymanfar, V., Taleizadeh, A., Pourmohammad Zia, N. Economic manufacturing model under partial backordering and sustainability considerations. Journal of Industrial and Systems Engineering, 2015; 8(2): 86-96. 1School of Industrial Engineering, Islamic Azad University, South Tehran Branch, Tehran, Iran. 2School of Industrial Engineering, College of Engineering, University of Tehran, Tehran, Iran. Today, “Sustainable production” has attracted a great deal of interest by academic researchers and practitioners due to the raising environmental and social concerns. Sustainable EPQ model has been developed as a result of this interest and also necessity. This paper develops a novel sustainable EPQ (SEPQ) model under partial backordering consideration. The model converts all emission variations of inventory production lifecycle into economic tangible factors. A solution procedure to determine the optimal solutions of the problem is developed for this SEPQ-PBO model. In order to demonstrate validity of the proposed model and applicability of the developed solution procedure, numerical examples accompanied by comprehensive sensitivity analysis of key parameters of the model are provided. Absi, N., Dauzère-Pérès, S., Kedad-Sidhoum, S., Penz, B., and Rapine, C. “Lot sizing with carbon emission constraints.” European Journal of Operational Research, 227, (2013): 55-61. Ambec, S. and Lanoie, P. "Does it pay to be green? A systematic overview." The Academy of Management Perspectives 22, (2008): 45-62. Battini, D., Persona, A., and Sgarbossa, F. “A sustainable EOQ model: Theoretical formulation and applications.” International Journal of Production Economics, 149, (2014):145-153. Benjaafar, S., Li, Y., and Daskin, M. (2013). Carbon footprint and the management of supply chains: Insights from simple models. IEEE Transactions on Automation Science and Engineering, 10, no. 1 (2013): 99–116. Bouchery, Y., Ghaffari, A., Jemai, Z., and Dallery, Y. “Including sustainability criteria into inventory models.” European Journal of Operational Research, 222, no. 2 (2012): 229-240. Bonney, M., and Jaber, M. Y. “Environmentally responsible inventory models: Non-classical models for a non-classical era.” International Journal of Production Economics, 133, no. 1 (2011): 43-53. Cheng, T. C. E. “An economic production quantity model with flexibility and reliability considerations.” European Journal of Operational Research, 39, no. 2 (1989): 174-179. Despeisse, M., Oates, M. R., and Ball, P. D. Sustainable manufacturing tactics and cross-functional factory modelling. Journal of Cleaner Production, 42, (2013): 31-41. El Saadany, A.M.A., Jaber, M.Y., and Bonney, M. “Environmental performance measures for supply chains.” Management Research Review 34, no. 11 (2011): 1202–1221. Glock, C. H., Jaber, M. Y., and Searcy, C. “Sustainability strategies in an EPQ model with price-and quality-sensitive demand.” The International Journal of Logistics Management, 23, no. 3 (2012): 340-359. Harris, F. “How many parts to make at once?” Factory: The Magazine of Management (Reprinted in Operations Research 1990; 38 no.6: 947–950) 10, no. 2 (1913): 135-136. Jaber, M. Y., Glock, C. H., and El Saadany, A. M. (2013). “Supply chain coordination with emissions reduction incentives.” International Journal of Production Research, 51, no. 1 (2013) 69-82. Katz, R. S. “Environmental pollution: Corporate crime and cancer mortality.” Contemporary Justice Review: Issues in Criminal, Social, and Restorative Justice, 15, no. 1, (2012): 97–125. Mukhopadhyay, A., and Goswami, A. (2014). “Economic production quantity models for imperfect items with pollution costs.” Systems Science & Control Engineering: An Open Access Journal, 2, no. 1 (2014): 368-378. Nouira, I., Frein, Y., and Hadj-Alouane, A. B. “Optimization of manufacturing systems under environmental considerations for a greenness-dependent demand.” International Journal of Production Economics, 150, (2014): 188-198. Pentico, David W., and Matthew J. Drake. “The deterministic EOQ with partial backordering: A new approach.” European Journal of Operational Research, 2009: 102-113. Rădulescu, M., Rădulescu, S., and Rădulescu, C. Z. “Sustainable production technologies which take into account environmental constraints.” European Journal of Operational Research, 193, no. 2, (2009): 730-740. Tao, Z., Guiffrida, A. L., and Troutt, M. D. “A green cost based economic production/order quantity model.” In Proceedings of the 1st Annual Kent State International Symposium on Green Supply Chains, Canton, Ohio, US, 2010. Wahab, M. I. M., Mamun, S. M. H., and Ongkunaruk, P. “EOQ models for a coordinated two-level international supply chain considering imperfect items and environmental impact.” International Journal of Production Economics, 134, no. 1 (2011), 151-158. Wang, H. F., and Gupta, S. M. Green supply chain management: Product life cycle approach. McGraw Hill Professional. 2011. Van der Veen, J.A., and Venugopal, V. “Economic and Environmental Performance of the Firm: Synergy or Trade-off? Insights from the EOQ model.” NYENRODE RESEARCH PAPER SERIES, 2011. Van der Veen, J. A., and Venugopal, V. “Economic and environmental performance of the firm: Synergy or trade-off? Insights from the EOQ model.” Handbook of EOQ inventory problems, (2014): 121-137. Springer US. Zhu, Q., Lujia, F., Mayyas, A., Omar, M. A., Al-Hammadi, Y., and Al Saleh, S. “Production energy optimization using low dynamic programming, a decision support tool for sustainable manufacturing.” Journal of Cleaner Production. (2014).